Palmilla — Palmilla features a signature Jack Nicklaus golf course with deep arroyos and breathtaking views of the Sea of Cortez. This luxury Los Cabos golf course is divided into the Arroyo Nine, the Mountain Nine and the Ocean Nine, five sets of staggered tee boxes, stunning fairways, four lakes and deep shifts in elevation. Ranked among the top 100 courses in the world by Great Golf Resorts of the World. This championship course is divided into the Arroyo 9, the Mountain 9 & the Ocean 9, all with breathtaking views of the Sea of Cortez, deep canyons & majestic desert landscape. Cabo Real — This extraordinary Robert Trent Jones designed golf course opened in Dec. 1994 & immediately gained worldwide recognition. The course boasts three spectacular ocean front holes, highlighted best during the 1996 PGA Senior Grand Slam, when breaching whales put on an amazing performance for the crowd & television audience just yards away from them. Puerto Los Cabos — Begin with The Shark & finish with The Bear. Featuring 18 holes of a composite design consisting of the front 9 holes from Greg Norman & the back 9 holes from Jack Nicklaus offering a unique opportunity for players to experience the difference in design philosophies & enjoy a "sneakpeek" of work yet to come. Never before has work from these great designers been used to create 18 holes. Club Campestre — Jack Nicklaus designed and opened in June 2007. With its spectacular views to the Sea of Cortez, canyons and mountains, Club Campestre San José invites you to enjoy the incredible panoramic views, dramatic elevation changes, and our undulating championship greens. Diamante Los Cabos — The Dunes Course is the newest addition and only course located on the Pacific side of the course. 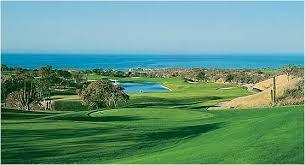 The Diamante Los Cabos is masterfully planned by 20 time PGA Tour winner, Davis Love III. 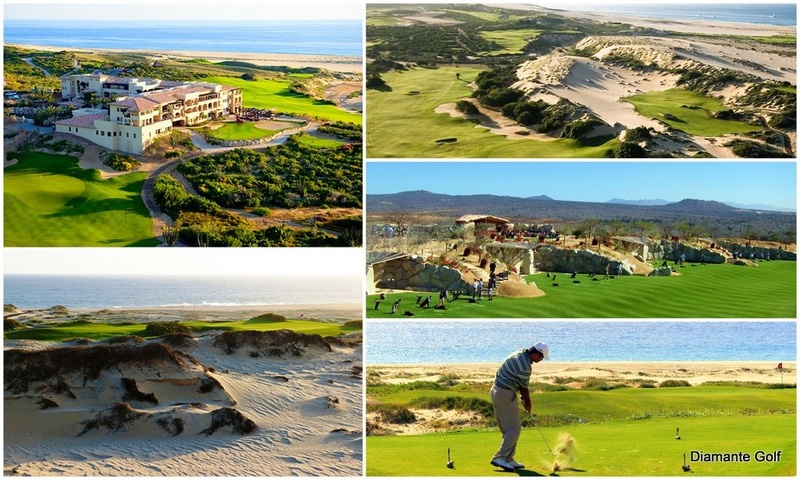 Situated along coastal dunes and hilly terrain covered with rich Baja bio diversity, the Dunes Course combines the tropical weather of Mexico with the values of the best links courses in Ireland and Scotland, all equaling a dramatic setting which will have heads turning and people talking about this world class golf course. Diamante Los Cabos has just began construction on their 2nd course designed by Tiger Woods. El Cardonal is influenced by the old-style courses of Southern California that he grew up playing, Tiger’s vision is to create a course that brings back the need for strategy – with several options to navigate each hole. As you can imagine, the course will challenge expert players, but it will also provide options for those with higher handicaps as well. It will truly be accessible and fun for golfers of all skill levels. Cabo del Sol — A world renowned Nicklaus design stretching for more than a mile along a coastline of craggy rock out cropping & sun washed shores. The Ocean Course layout is praised by Nicklaus himself for having the “ three finest finishing holes in all of golf ". The signature 5th & 17th holes are currently ranked among “ The 500 Best Holes in the World ” according to Golf Magazine. This masterful Tom Weiskopf design features mesmerizing ocean views from all 18 holes, each artfully sculpted through incredible natural surroundings. The course varies in length from 4,810 to 7,100 with undulating greens, challenging elevation changes & dramatic bunkering. Cabo San Lucas Golf & Country Club — Designed by the renowned Dye Corporation, the fairways are positioned on gently sloping terrain overlooking the Sea of Cortez; the only course in Los Cabos with a view of the Land's End rock formations. This 745 acre course has been built in an area of classic desert beauty while maintaining the fragile ecosystem. The Cabo San Lucas Country Club remains a natural habitat for all manner of flora and fauna. Quivira — With a spectacular backdrop along one of Mexico's most dramatic stretches of oceanfront property, the two Jack Nicklaus courses, one private and one resort course are anticipated to be some of the best in all of Mexico. Unique natural terrain including massive sand dunes, rugged cliffs, golden sand beaches & desert canyons allows holes that hug the shore. Querencia — Designed to take its place among the world’s most prestigious private golf communities, Querencia offers a Tom Fazio - designed championship golf course nestled within an exclusive 880-acre community along the Sea of Cortez in the Los Cabos Corridor. No stone was left unturned in building Querencia. Fazio works with nature and its given elements to deliver a spectacular and very private golf experience. The landscape is reminiscent of a desert setting but with bold topography and fantastic long range ocean views. 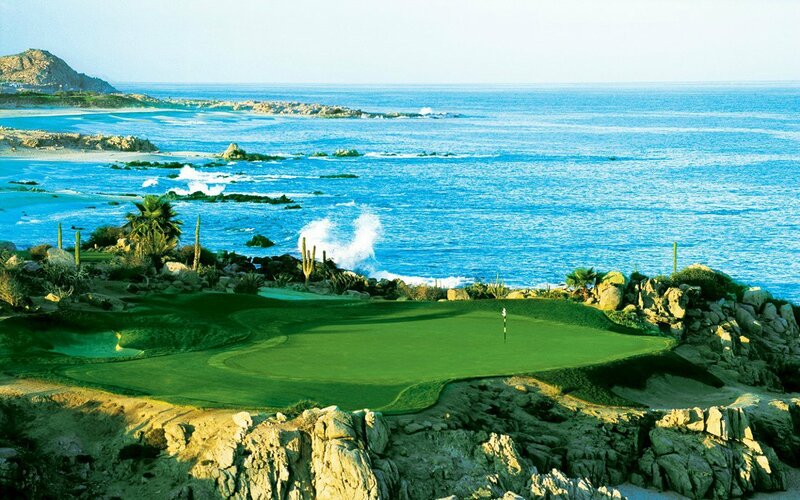 Punta Sur — Originally built by FONATUR as the 1st golf course in all of Los Cabos. 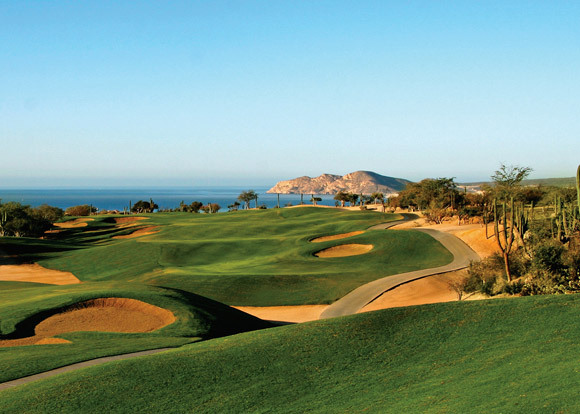 Punta Sur offers players some of the most interesting golf in Los Cabos. Although not ranking world class like its sister courses, it still remains competitive & affordable. El Dorado — Envision a Jack Nicklaus designed course that blends with rather than dominates the natural landscape. The result is a golf course that links the drama of the coast to the desert in a new translation of golf’s great architectural traditions. El Dorado is a stunning and memorable golf course. There are 4 sets of tees and rolling saddled fairways leading to scenic green sites and head-turning bunker complexes. Chileno Bay — Breathtaking views await you and your companions when playing the double header concept design from Tom Fazio, each course is crafted to meld into its natural surroundings & capture the unique Baja terrain. Costa Baja — This golf course will be the first Gary Player Signature Course ever to be built in Mexico. This unique course features panoramic views of the Sea of Cortez & an innovative design that complements the unique desert-by-the-sea landscape. The course will ensure the preservation of the surrounding delicate ecosystem & blend seamlessly into the unique desert-by-the-sea landscape. Its innovative design will challenge the most accomplished golferwhile providing a magnificent & breath-taking backdrop. Paraiso del Mar — Is the 1st course designed in La Paz & Arthur Hill's 1st course in Mexico, inspiring him to achieve the highest level of international standard possible. ”Paraiso del Mar is one of the most natural & beautiful sites for a golf course that I have seen in my 40-year career as a golf course architect.